Cooking is an art, and when you know how to pair the ideal wine with your favorite meals, you elevate your game as a home chef. Choosing the right wine to complement grass fed beef recipes requires an understanding of the flavors you are combining. In general, wines should be more acidic and sweeter than the food they accompany, and they often have a similar flavor profile to the main dish. Let’s take a look at why grass fed beef and wine work so well together, and how you can impress your guests by pouring them the perfect glass of vino at your next dinner party or family feast. You’ve likely heard that beef tends to pair best with red. This is thanks to the tannins found in red wine. Tannins interact with the proteins in red meat to make a delicious combo, breaking down the fat to release more flavor. Researchers have also found that dry red wines and fatty meats work well together because they balance textures in our mouths. The slipperiness of the fat is offset by the astringent qualities of red wine. For steaks, keep in mind that the rarer it is, the more the meat will lessen the sensation of tannins. If you choose to enjoy white wine or rosé with steaks and grass fed beef recipes, there’s nothing wrong with that. While red wines create a congruent pairing with beef because they share flavor compounds, lighter wines give you interesting and contrasting flavor pairings. A well-marbled, pan-seared, grass fed ribeye steak provides plenty of savory flavor, giving you a juicy steak that pairs well with full-bodied wines. Be aware that bone-in cuts can slow cooking time. The high level of tannins in a Syrah (aka Shiraz) makes it an ideal partner to ribeye steaks. Wine Enthusiast specifically recommends the 2011 Les Voisins Yorkville Highlands Syrah from Copain Wines. The New York strip is another marbled cut, giving you a tender filet that is one of the most popular choices among steak lovers. Merlot matches very well with a grilled NY strip, but the folks at Kendall-Jackson wines say the flavor profiles could be “too matchy” and make the pairing feel heavy. A good Cabernet Sauvignon is always a safe bet with your grass fed New York strip steak. Cabernet also pairs well with grass fed tenderloin. Because this is a somewhat leaner cut of meat, Fine Cooking suggests you may want to choose a wine with tannins that have softened through aging when serving roast tenderloin. Fine Cooking’s Tim Gasier recommends serving Hawk Crest Cabernet Sauvignon with your tenderloin roast. Sirloin is another leaner steak, which calls for a light- or medium-bodied red wine. A good red wine blend with jammy flavors would be a nice choice here. Considering how the meat is cooked is yet another factor impacting which wine you pair with the meal. Grilled grass fed sirloin may work well with red wines that have smoky undertones. You can slice up your top sirloin to make some scrumptious steak fajitas. But, what kind of wine goes with Mexican food? Rather than margaritas or cervezas, try a Zinfandel with these types of dishes. The writers at Wine Folly note that spicy Mexican dishes pair better with colder, sweeter wines that have lower alcohol and moderate tannins. This helps lessen the burning sensation on your tongue. Try a glass of wine with our meaty taco dip recipe, featuring grass fed ground beef. A savory beef roast recipe makes for a meal full of rich flavors. Many roast recipes include burgundy wines as an ingredient. When choosing the ideal wine to drink with this dish, Bordeaux, which is a blend of Cabernet and Merlot, makes a nice selection. A poll of readers at Matching Food and Wine shows red Bordeaux is the most popular choice to serve with a classic roast with a third of participants making it their pick. In second place, nearly a quarter suggested a Rioja. Try using Grass Run Farms Grass Fed Chuck Arm Roast when you pile on the carrots, onions, and potatoes in your slow cooker. Beef stew is another hearty meal for your slow cooker, and Grass Run Farms offers 100% grass fed beef stew meat to make preparation extra easy. Italian cuisine begs to be served with a bottle (or two) of vino. Italian reds are the obvious choice, but there are many to choose from. Food & Wine suggests a Lambrusco as a fun option to serve with a robust meat sauce like Bolognese. Writer Kristin Donnelly points out that Lambrusco varieties range from light and pink to dark and tannic. She suggests looking for something in the middle that is “bright and fruity.” Need a recipe? Try making our Bolognese and noodles dish using grass fed ground beef. Dinner doesn’t have to be fancy in order for you to serve wine. Instead of beer and burgers, try pairing your patties with a Pinot Noir. The wine you drink with your cheeseburger should usually be paired with the cheese and other toppings (bacon, grilled onion, jalapeno, etc). Pinot Noir works well with your standard American or cheddar charbroiled cheeseburger. Wine Enthusiast says its earthy tannins stand up to charred meat with acidity to cut through the cheese. 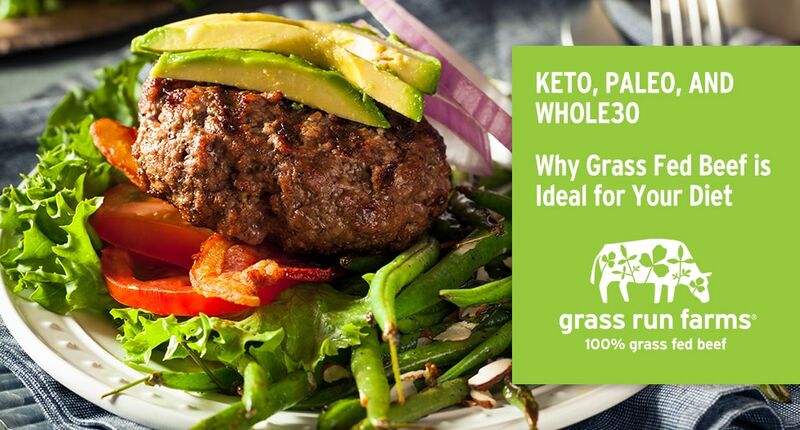 Check out a few unique grass fed burger recipes from Grass Run Farms, including a Cali Cheese Burger featuring pepper jack, avocado, and chipotle mayo. You put time and effort into the meals you prepare. That’s why your care about pairing the right wine with each dish. And, it’s why you start cooking by using quality ingredients, like grass fed beef. Grass Run Farms’ products taste good and let you feel good about your choice of meat. Our beef comes from family farms in America’s Heartland where cattle are 100% grass fed. Learn more about the Grass Run Farms story, and find a store near you that offers our products. Get more ideas for your kitchen involving beef and brandy as well as beef and beer when you follow us on Instagram!